The muscularis externa of the small intestine consists of smooth muscle fibers arranged into an inner circular layer and an outer longitudinal layer. 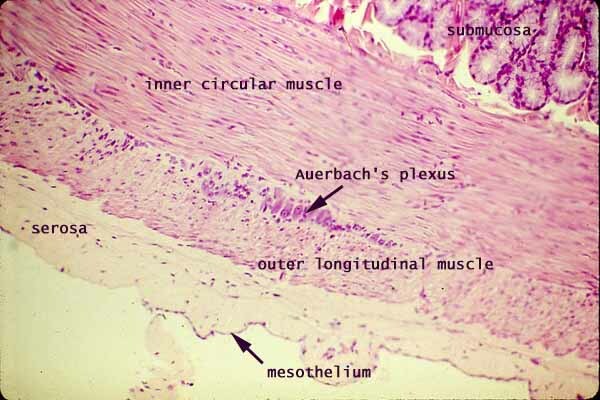 Between these two muscle layers is a network of unmyelinated nerve fibers and parasympathetic ganglia called Auerbach's plexus (or myenteric plexus). The serosa consists of connective tissue with a delicate covering of mesothelium (simple squamous epithelium derived from mesoderm). The appearance of smooth muscle varies dramatically, depending on the orientation of the fibers with respect to the plane of section. Note the submucosa at upper right in this micrograph appears to be packed with mucous glands. Which segment of the small intestine has this submucosal appearance?